How to uninstall An Installed Program and Software on my Window 7 system? I want to get rid of that software from my computer. 1. Click "Start > Control Panel" menu. You see the Control Panel screen showing up. 2. Click the "Uninstall a program" link in the "Programs" section. You see the "Uninstall or change a program" screen showing up with all Installed Programs and programs listed. 3. 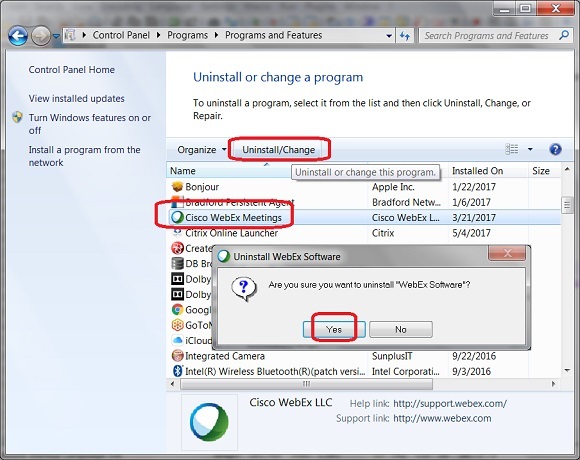 Scroll down on the list to locate and select the software or program you want to uninstall, for example, "Cisco WebEx Meetings". 4. Click the "Uninstall/Change" command above the program list. The selected software will be executed to run its own uninstallation process. 5. Follow instructions given by the software's uninstallation process to finish it. Note that this approach may not the safest way to uninstall a malware (malicious software, including adware, spyware, virus, etc. ), because Windows actually executes the malware and expects the malware to properly uninstall itself. The malware may actually fake the uninstallation process and hide it somewhere else. If you are sure the Installed Programs or program is a malware, do not use control panel to uninstall it. Please use an anti-virus software to remote it.